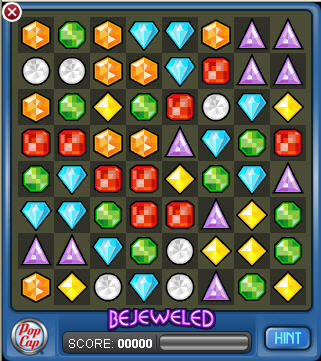 Yesterday, PopCap Games released a free iPhone version of Bejeweled. How does it play? Depending on your access (Edge vs WiFi), it takes about a minute to download. Once you start playing, it flows well. Is it as good as a local version of Bejeweled on a Treo, no. The animation isn’t as smooth and you can’t choose your next move while the jewels are falling. And unless I was doing something wrong, it is missing the addictive sound and music. Overall, props to PopCap Games. They’ve shown that it is possible to make a decent iPhone game on the web. I’m looking forward to what other software developers are able to deliver.